Got them on my car, but my car is silver. To each there own. For me, custom paints schemes on a daily driver is too much and (unrelated to this thread) black rims look bad without a machine finished lip. Last edited by backroad101; 12-23-2011 at 03:16 PM. If only it didn't look so bad, makes the car look like you missed a few spots. See, now this car does not work for me. I not into chrome rims or gas caps (or any gas cap trim really). Even the doors handles with this color does not exactly work for me (I'd have to see it as the only chrome on the car). The ground effect aren't my thing either. 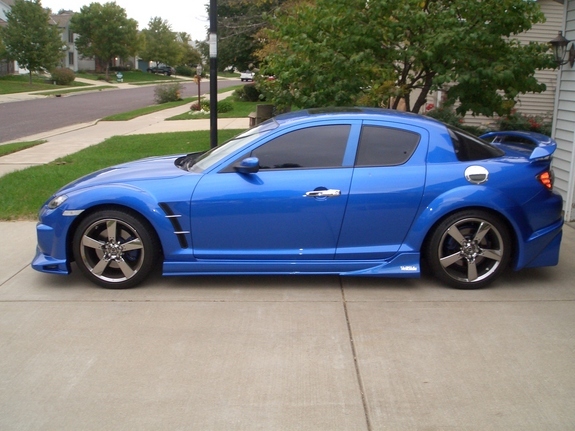 With this RX8 pictured (when it was stock) I'd get some tastefully subtle 19" (maybe 20") rims, tint the windows, do those accents on the fender vents (if those are not standard) and door handles if I could find ones that are mostly body color with a machine finished or chrome trimmed outer trim. And HIDs if it didn't already have them. Wouldn't do much else. Sorry if this is someone's car, this was not meant to offend, just my personal taste. Everyone is different. If I wanted to offend, i guess I could have said WTF, that's ugly (which I did not). Last edited by backroad101; 12-23-2011 at 03:20 PM. when you say coulour scheme and customizing what are you intending on modifying interior panels adding lighting ?? Plasti Dip Your Whole Car!! Not very many people have done it though. Heck there is even a clear coat you can apply on top of it. And you could do something like the entire car red, then black accents or stripes. Look sweet! The Blue Cube - A Unique, Premium Hand-Picked Game Arcade!